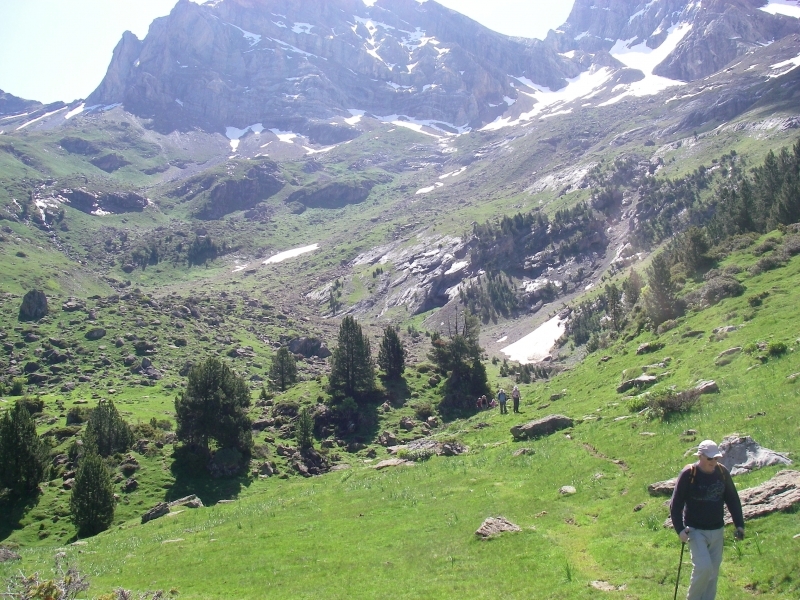 walking holidays pyrenees, Explorer level. 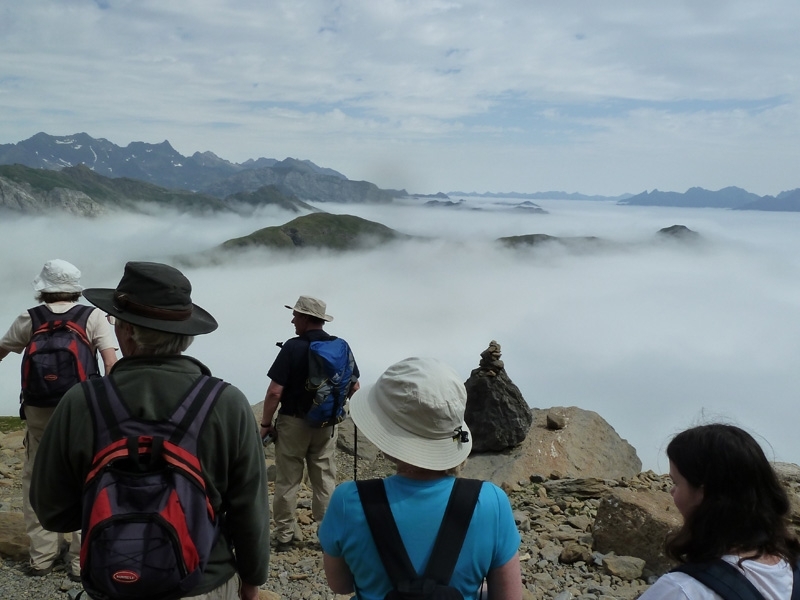 This walking holiday is based in the stunning French High Pyrenees. Our week of walking takes us from the valleys where centuries old farming practices are still used, through sleepy mountain villages, steeped in history with traces of the Moors, Templar knights, French Kings and Napoleon. 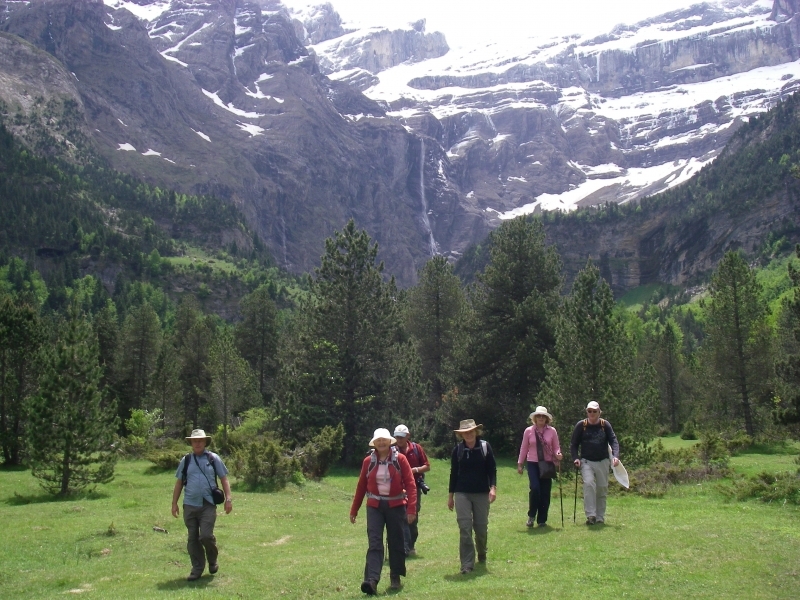 In the high mountains we visit the impressive cirques of the UNESCO World Heritage Site, including the Cirque de Gavarnie or Troumouse, and we have the chance to dip our feet in a glacial mountain lake or tinkling streams. 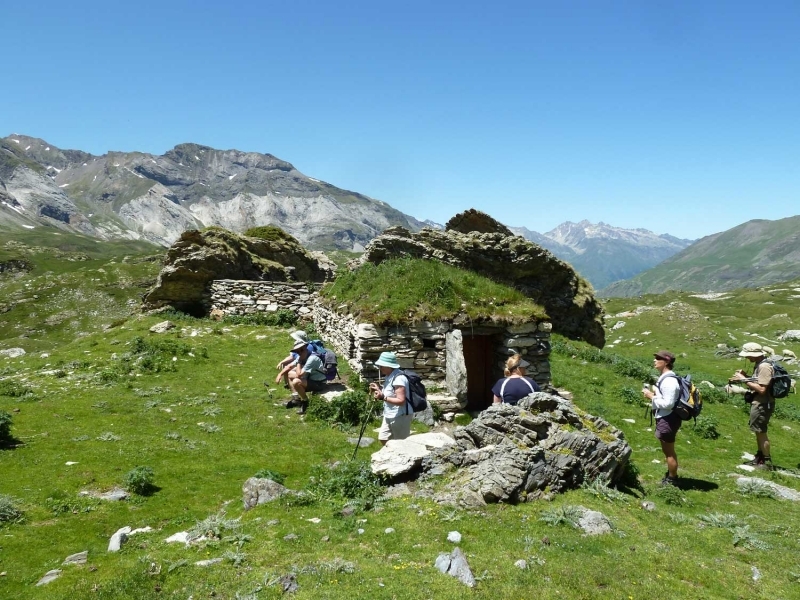 Along the way on this Explorer level walking holiday you will find out more about the native flora and fauna, which you may otherwise have missed, as well as the local culture, language and traditions of the Pyrenees. 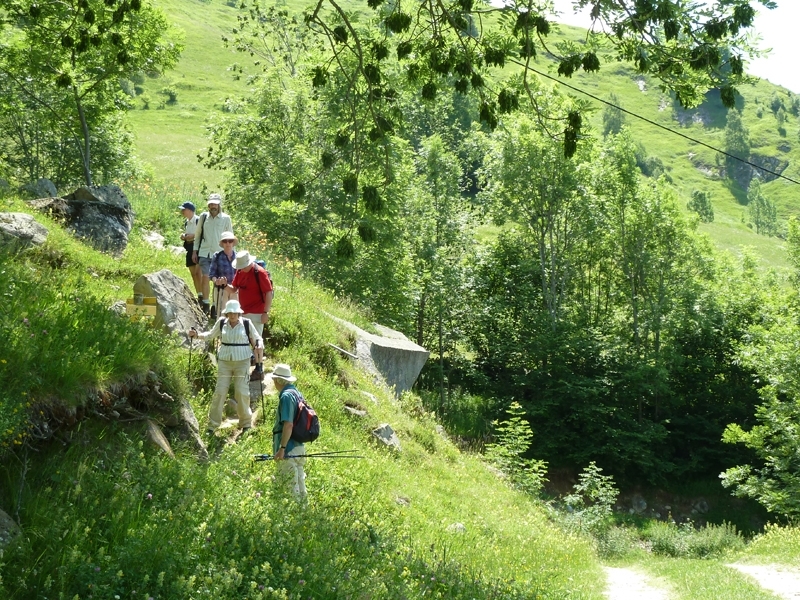 For this walking week you will be staying at our 3-star chalet “Les Cailloux” based in the traditional French mountain village of Barèges, in the Pays Toy. Like in all mountain ranges, the Pyrenean weather can be varied and unpredictable. Typically we have clear skies and sunny days during the summer walking period but it can equally rain, snow, or we may see fog or thunderstorms. We advise our guests to come prepared for any weather by packing layers and full, lightweight waterproofs. A walk that begins in rain can end in glorious sunshine and vice-versa. Due to the nature of the mountain terrain, we recommend you wear broken in walking boots or walking trainers with a sturdy sole. Your guide will plan your day’s route to make the most of the weather, which is why our itinerary isn’t totally fixed. We suggest a stroll round the village before dinner and your Welcome Talk, where we’ll go over details about what we will do and where we will go on this Explorer level walking holiday. During your Welcome Talk you’ll meet your guide for the week. You will have a chance to find out about the week ahead, discuss logistics for it, and ask questions about where you are going and what you’ll be doing. An interesting introductory walk from Barèges, giving us a chance to get to know the area and view the stunning setting of the village. 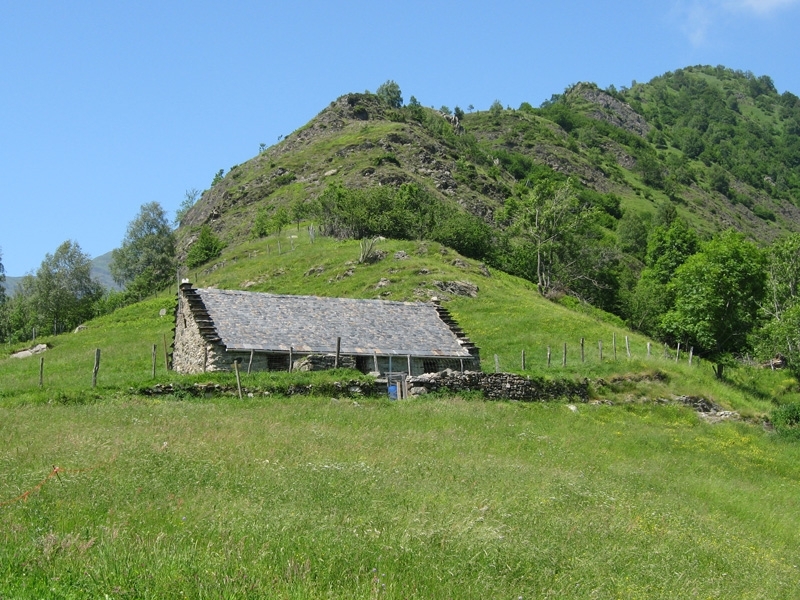 Leaving Barèges (1250m), we cross the Bastan river and climb steadily to the Transarrious plateau. This glacial platform is a favourite grazing area for the local Barèges-Gavarnie sheep (brebis). We follow a farmers’ track through the meadows and past a series of ancient stone barns – built in to the hillside to protect from avalanches. We then move high above the valley through meadows and hazel coppice. The path stays almost level, while the valley drops away beneath us – soon giving us a great vantage point above the village. Reaching the Croix de St. Justin we can enjoy a traditional French snack and drink in the sunshine at the St. Justin creperie. The restaurant, accessible only by foot, is on an isolated promontory looking out onto the lovely Bastan valley, the village of Barèges and towering mountains on every side. From the promontory, we look down on the ancient village of Sers, and across to the barns and “estives” (summer pastures), getting an insight into the traditional way of life in this area. 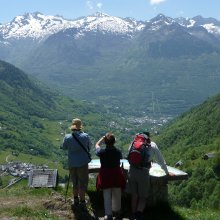 An easy walk through mixed woodland takes us back towards Barèges, with great views of the village and up towards the Col du Tourmalet. A visit to one of the most beautiful cirques in Europe. A UNESCO world heritage site, Cirque de Gavarnie is a natural amphitheatre of towering cliffs and spectacular waterfalls. A lovely drive up the steep-sided valley of the Gave de Gavarnie takes us to the small village of Gavarnie (1365m). Once a traditional farming village, Gavarnie is now famous for its cirque – a UNESCO world heritage site, and winter ski station. We start our day with a steep but steady climb through thin woodland towards the Plateau de Pailla. From here we follow a lovely path that traverses through the woods above the valley floor. At 1570m we meet the main path at the centre of the cirque, now completely surrounded by towering 1000m high cliffs. With Spain just the other side of these imposing mountain faces, you have an optional climb (a furthur 200m ascent) to the foot of the Grande Cascade – a spectacular 400m waterfall. We complete our circuit with an easy descent to Gavarnie village along the open valley floor, stopping off for a drink and ice-cream en-route. A fascinating day discovering the history and culture of the valley. 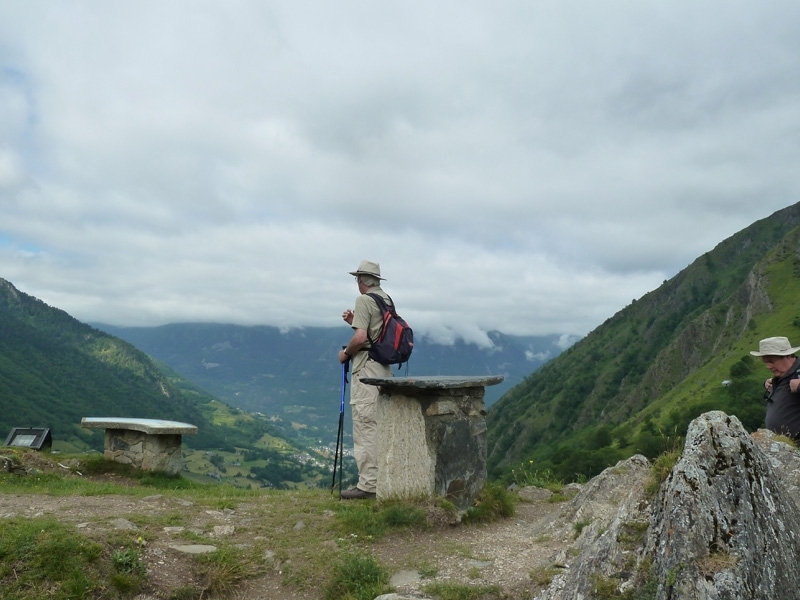 Departing on foot from Barèges, we make our way down to Luz Saint-Sauveur, visiting several historic villages and important local landmarks along the way. Depending on the weather and other conditions, we can choose our route today. If we take the South side of the valley, we visit the World War II Resistance settlement, Camp Rollot, the flowery meadows of the Plateau de Lumiere and the pretty farming village of Betpouey. If we go on the North side of Barèges’ valley, we go through Sers (the oldest and most sunny village of the valley) and the traditional cobbled streets of Viey. At the bottom of the valley, there is time to share a drink with the mayor of Viella, before walking up to the ruins of the Chateau de Ste. Marie. This ancient lookout above Luz Saint-Sauveur was originally constructed in the 10th century, but has been adapted many times since, notably by the English in the early 15th century. Making our way down from the castle, we explore the old centre of Luz, including the fortified Templar church. Then, if time allows, there is an optional extension to see the chapel of Solferino and the impressive Pont Napoleon – a single-arched bridge spanning 90m above the gorges of Luz. There are a range of options for your free day. You could visit Barèges’ thermal spa, the highest in France, or perhaps take a trip to the Pic du Midi observatory. It’s also possible to take the bus to Luz St-Sauveur or the pretty spa town of Argelès-Gazost. Here you can stock up on the delicious local sheep’s cheeses and ‘saucisson sec’ (knobbly French salamis). For those who can’t get enough exercise, there are plenty of trails to be explored on foot from Barèges, and we can arrange activities including paragliding, caving, rafting, pony trekking, mountain biking, canyoning etc. This higher and wilder big brother of the Cirque de Gavarnie, is also right by the Spanish frontier. The Cirque de Troumouse is a vast ring of snow-capped limestone peaks, surrounding idyllic green meadows, dotted with grazing sheep and cattle, and ice-cold ephemeral lakes. Leaving Barèges, we drive through the village of Gèdre, then take a winding mountain road all the way up to the Cirque de Troumouse, above 2000m in altitude. We begin the day with a hike up to a statue of the Virgin Mary, standing watch over the cirque. From here we follow the ridge down to a superb lookout point across the classic glacial U-valley of Heas. Now meandering across the meadows, we make our way across the cirque to find a perfect picnic spot beside the Troumouse lakes. These ephemeral lakes are fed by melt water from the small glaciers that still cling to the North wall of the cirque. They are too cold for swimming, but great for a refreshing foot-dip! 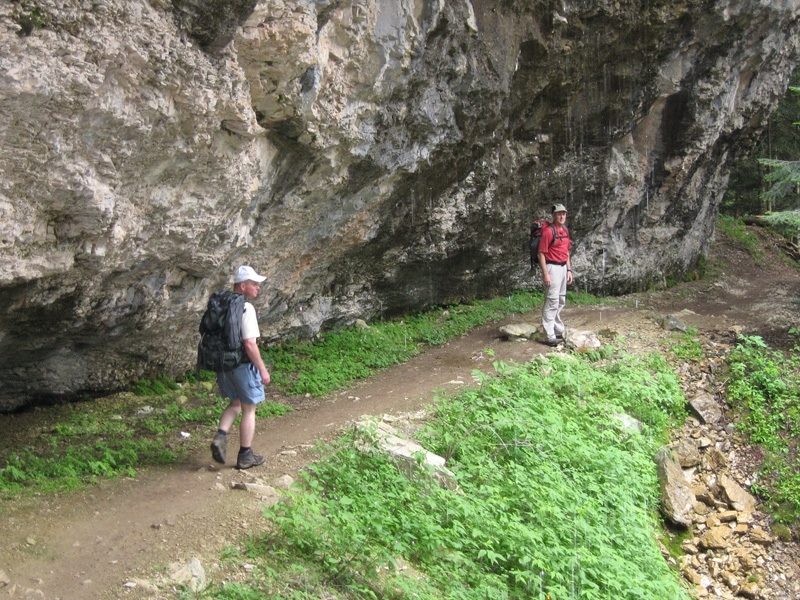 On our return journey, we pick a route through fallen limestone blocks. 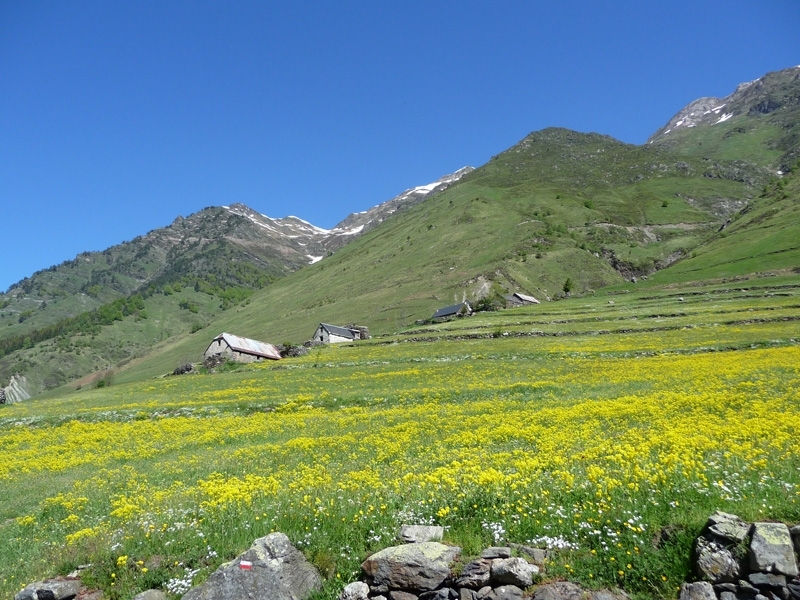 Away from the main path we have a good chance of spotting marmots or Pyrenean chamois, isards, and the wildflowers are truly spectacular in the Spring, from late May to early July. A climb or ride on the chairlift up to the famous Lac de Gaube and a stroll around the lake, then a pretty walk down to the Pont d’Espagne through shady woodland. In the afternoon we take the Chemin de Cascades – following the Gave du Marcadau as it crashes to the valley bottom in a series of waterfalls. An impressive drive through deep, narrow gorges takes us to our neighbouring valley of Cauterets. From here we drive up to the cross-country ski station of the Pont d’Espagne (1496m). We then climb 250m to the Lac de Gaube (1725m), with the option of taking the chairlift for those who prefer a more relaxed pace. 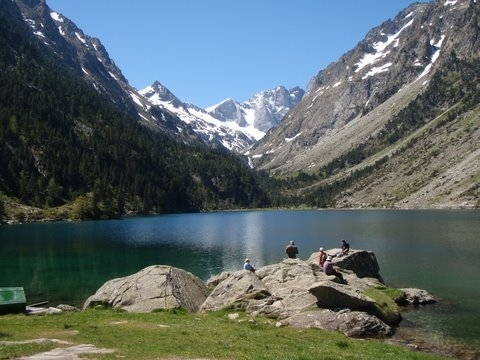 The Lac de Gaube is one of the most famous sights of the Pyrenees – an enormous blue glacial lake fed by meltwater from the glacier on the North Face of the Vignemale (the highest mountain in the French Pyrenees). After a relaxing stroll beside the lake, we return to the Pont d’Espagne via a zig-zag path through pretty woodland. Now we make our way back towards the town of Cauterets, along the Chemin de Cascades. This 4km path follows the rushing Gave de Marcadau as it plummets over at least five waterfalls. The landscape is one of rounded granite boulders, clear waters and sandy beaches beneath gnarled pine trees. We meet our transport at La Raillère and drive into the lively spa town of Cauterets, where we take an hour to explore the town and sample the cakes at (possibly) the best tea-shop in the South of France. The time is yours before you leave by mid-morning to make your way home. There’s time for a rejuvenating dip in the thermal spa or a short local walk and lunch in a village restaurant. We can arrange to look after your luggage if you don’t need to leave the area until later and wish to still enjoy your time in the Pyrenees.